iam not sure if you liked this new Who-Wore-It-Better feature. Suri going to a dance class in Pacific Palisades on Thursday, 28. 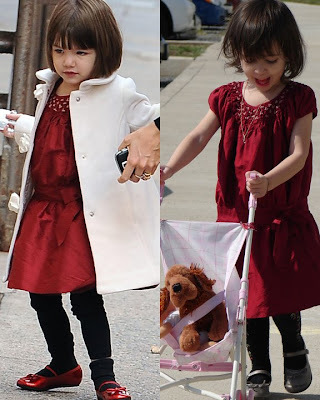 Suri is wearing Sunflower Tank Dress in Hot Chocolate Color by GAP. Suri holding tight My Little Friend Bunny by Jellycat on August 7th 2007. Suri carried Olivia The Pig and the smaller pig Katie is holding - Pansy Piglet Floral Friend by Jellycat, on December 10th 2008. Suri is holding Slackajack Duck Small by Jellycat on October 7th 2008. 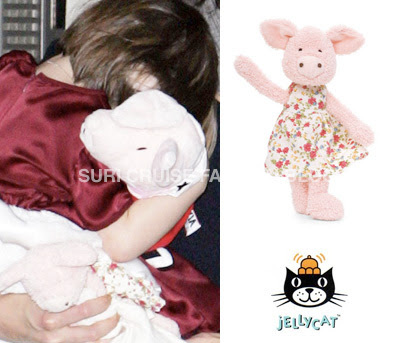 Suri together with Conor (not pictured) and Tom enjoyed a lunch in Caffè Milano on Saturday, 23. 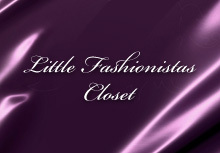 Suri is wearing Flower Tiered Dress in Frosted Berry Color from Flower Child line by Baby GAP. Thanks to one of the readers for the hint. 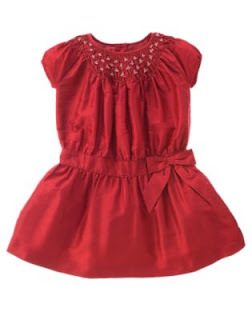 Suri wore this Flutter Sleeve Tank Dress in Raspberry by Twelfth Street Baby while attending the taping of American Idol Finale episode on May 19th. 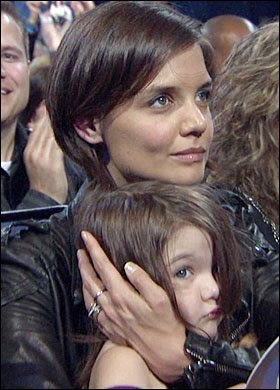 Suri & Katie attend the taping of last night's American Idol Final episode on Tuesday, 19. Unfortunately it looks like all the fun might have been a little too much for Suri, as Katie had to cover her ears to block out the cheering fans in the audience. Suri & Katie leaving a dance studio in Los Angeles on Monday, 18. Suri & Katie were spotted grabbing some sweet treats at Le Pain Quotidien on Thursday, 14. Suri is wearing Rose Tropical Dress by Splendid Littles, which she first wore on August 19th 2008. This dress is from '08 collection and its SO now, but a different model of this dress is available here. Suri and Katie hold hands as they leave a dance studio in Pacific Palisades on Thursday, 14. 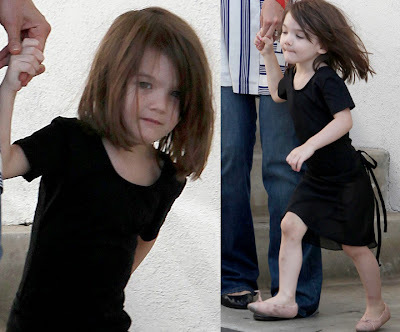 Suri is wearing AGAIN this Black Leotard by Danskin. Please, let it be the last time she is wearing it.. cause its boring. Just for fun, I am adding "Who wore it better?" poll. This is a gorgeous Hand-Smocked Bullion Silk Dress from Uptown Holiday line by Janie & Jack. Suri completed her look with White Rosette Coat by Janie & Jack and Red Ballet Flats from Nordstorm, while out for a city stroll on December 6th 2008. Cecilia wore this dress with Pewter Mary Jane Shoes & Black Tights, while going to church on March 23rd 2009. The only thing i don't like about Suri's outfit is this bulky leggings/socks combo..., on the other hand Cecilia's overall look is too casual. Suri's hair looks perfect, so she wins it for me. Labels: Janie and Jack, Who Wore It Better?